The theme of this book is the integrity of Creation. 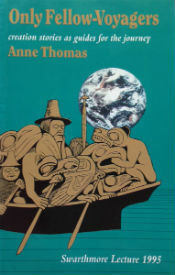 Anne Thomas shares her insights with us, drawing principally from the book of Genesis, and from creation stories of other cultures. She shows how the original meaning of Genesis has been distorted out of its cultural context, and used by theologians to emphasize humanity as having power over creation; instead of the holistic creation-centered spirituality that recognizes and venerates the Holy Spirit within creation. A Swarthmore Lecture 1995.